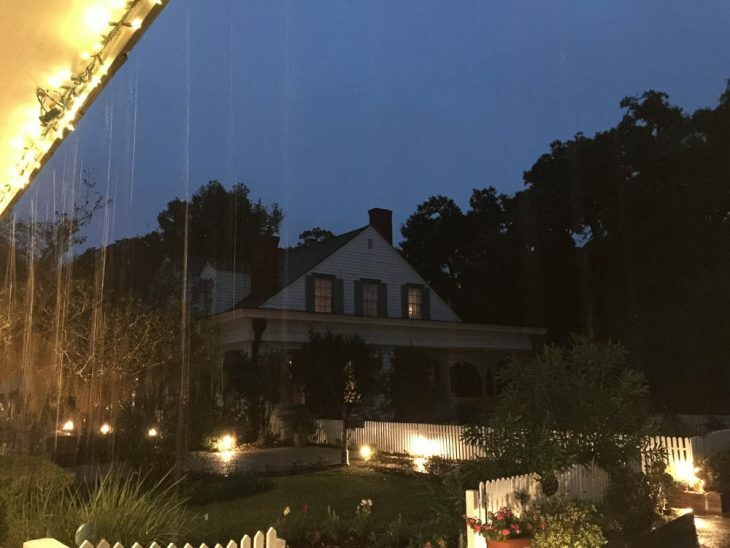 It was a dark and rainy night when we arrived for our mystery tour of the Myrtles Plantation. Reported to be the most haunted plantation in Louisiana the weather lent to the eerie feeling surrounding the plantation on Halloween night. Rain beat down outside while inside we were chilled to the bone by stories of hauntings that have been occurring at the plantation for over a century. Stories of dolls relocating on their own, shaking beds, haunted mirrors and more were shared with us. Although, I loved the stories during the tour, one of the best stories came from the owner which I’ll share in a bit. 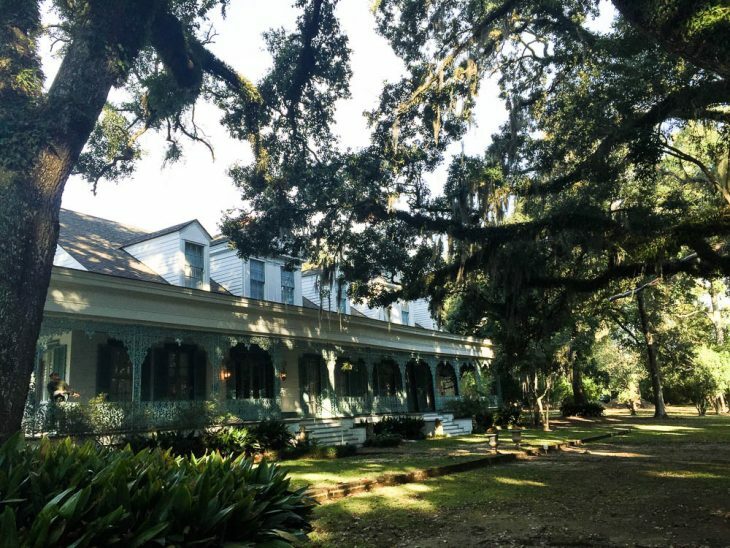 Those that are interested in the paranormal and haunted locations have probably heard of the Myrtles Plantation in St. Francisville, Louisiana. Located about 40 minutes north of Baton Rouge the Myrtles Plantation has been designated as the most haunted plantation in Louisiana and may be considered, by some, as the most haunted plantation in the entire South. 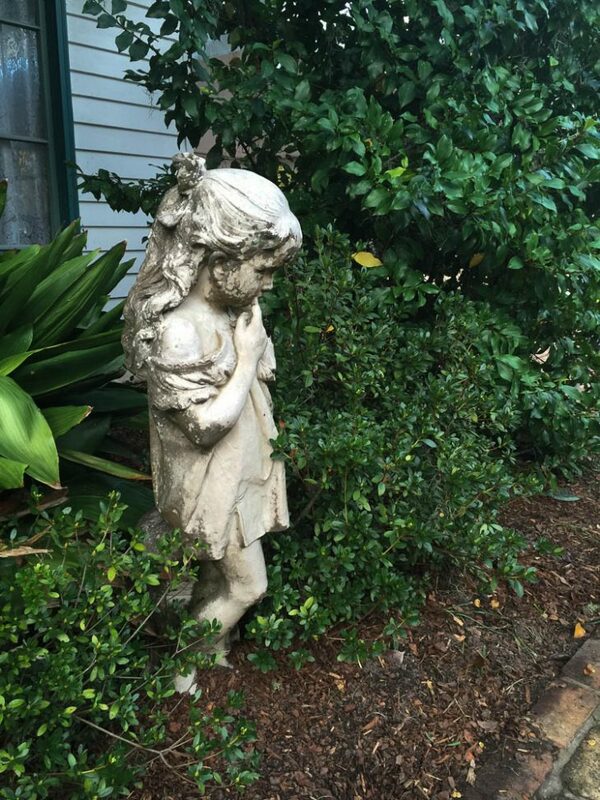 Even if you aren’t a believer or have any interest in the paranormal a stay at the Myrtles Plantation is a must for the historical factor and beauty of the property alone. Built in 1796 this 18th century plantation is surrounded by old live oak trees and lush green grass. The home has a lovely 125-foot verandah and you can easily see that no expense was spared on designing and decorating both the interior and exterior of this lovely plantation home. You’ll find stained glass, iron work, Baccarat crystal, marble mantels, gold leaf furnishings and so much more. This was a home for wealthy families, but it comes with more than a few bone chilling stories that will keep you awake at night wondering if you’ll get a visit from Chloe or one of the other ghosts that haunt the home and land. Today, the plantation operates as a B&B and tourist attraction. 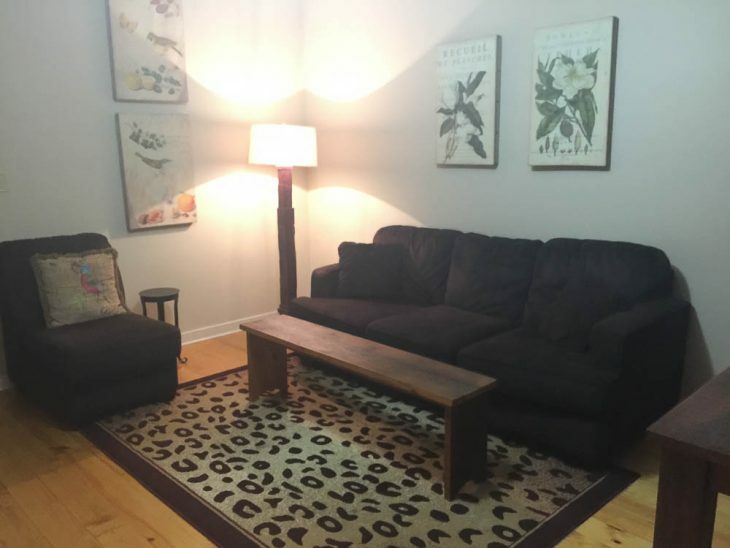 It offers 6 rooms in the main home and a number of rooms and cabins on the property. 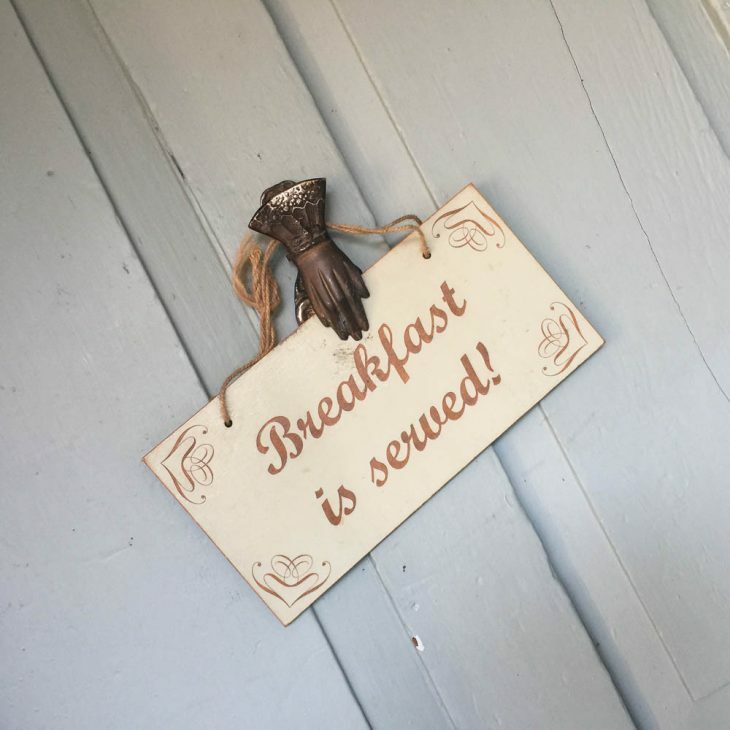 A buffet style breakfast is served in the morning in the gift shop and comes complete with coffee, juice and an array of hot foods. We stayed in the Cypress cottage just a short walk from the main house. 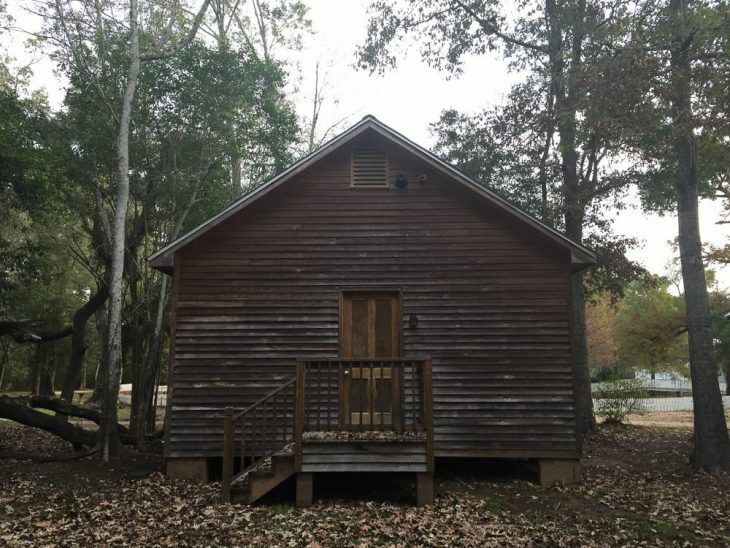 Cypress is a 2-room cabin with 2 double beds and a single bed in the bedroom, enough room to easily sleep 5, plenty of seating, and a table and chair set in the main room. The cabin is very comfortable and we slept really well during our stay. I was really, really hoping for a paranormal experience during my visit, but it didn’t happen. I’m not disappointed about it though. Experiences seldom happen when you want it to. I will, hopefully, go back at another time and spend a couple nights and see if anything happens then. 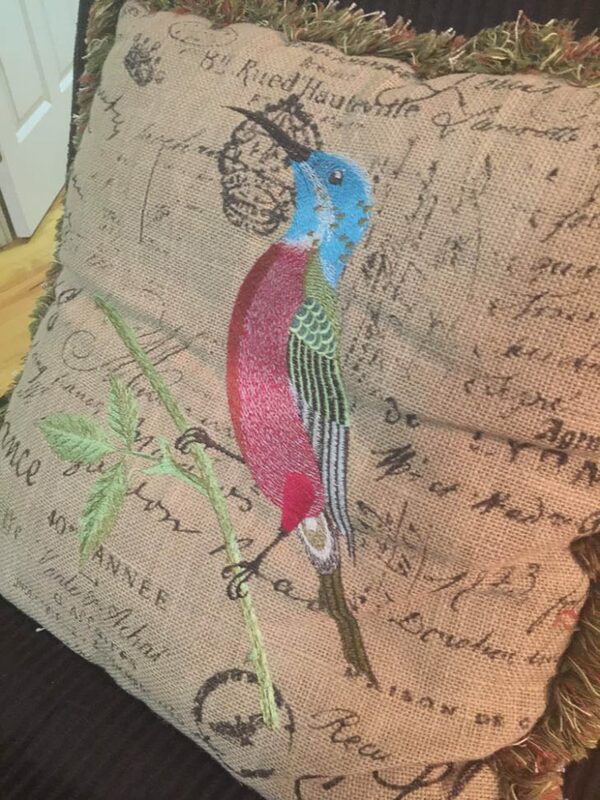 I love the bird motif found throughout the Cypress Cabin. The Myrtles host historic and mystery tours year round. The tour guides visitors through the foyer, master bedroom, dining room, ladies parlor, men’s parlor and the game room. As you visit each room you’ll be greeted by a period dressed guide who will share the rooms unique story. We took the mystery tour on Halloween night with a large group and even though nothing paranormal happened in the house the stories were still interesting to listen to. Stories of murder are embedded in the history of the home. A young slave girl murdered at the hands of her owner after she was found guilty of murdering his wife and two small children (although, she didn’t intend to kill them, only make them sick, the outcome was not good for anyone). Another owner being shot on his front porch and, with the help of his young son, making his way back indoors and up to the 2nd floor where he died in front of his wife. These stories and others seem to have left a lot of negative energy bouncing around the home which lends itself to the paranormal activity experienced by some here. Stories from the current owners include a number of guests leaving the B&B in the middle of the night never to return or be heard from again. Shaking beds, porcelain dolls that find their own way around the house (THOSE are the creepiest stories, in my opinion), voices being heard, footsteps when no one is around, and one heart wrenching story about how the spirit warned a mom to check on her baby which resulted in her saving him from falling in the pond. She was told to “never fear, no harm will come to your children here”. 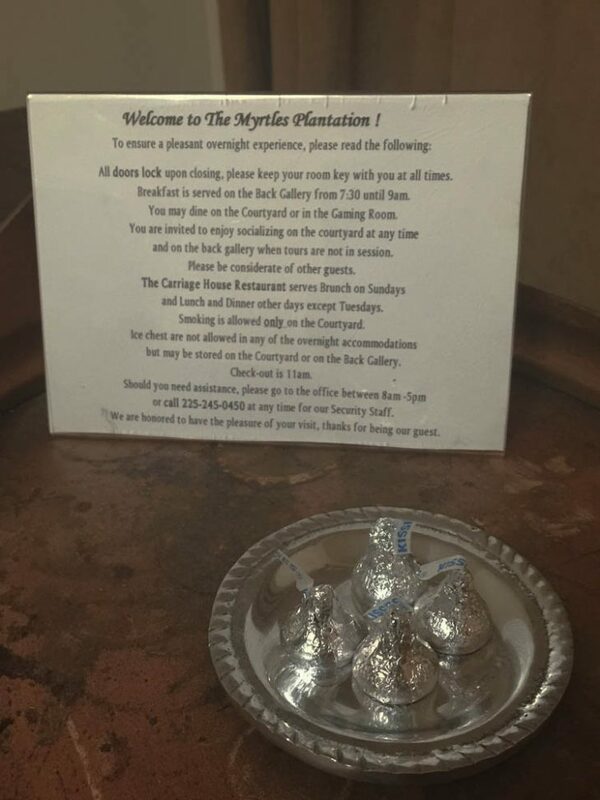 It’s a long story and that is just a snippet of it, but when you are at the Myrtles you may be able to convince the owner to share the full story. During breakfast, after our night in the cabin, I spoke to other guests and asked if they had any unexplained experiences, but no one was willing to admit to anything. 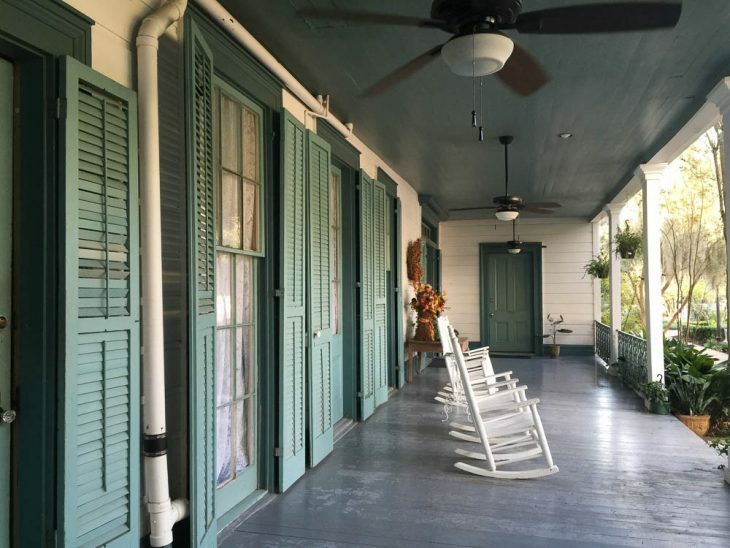 An older retired couple gave up a week in Mexico to spend the night in the Myrtles Plantation. Nothing happened to them, but they said they had a wonderful stay and would gladly return again. A younger couple (late 20’s ish) couldn’t convince any of their friends to come stay at the Myrtles with them, but they made it through the night without incident. Of course, many of my friends thought I was crazy as well to stay overnight at the Myrtles as well, but I loved it. For some people the paranormal scares them, but for me it intrigues me and I love exploring and staying at places with a good, haunted history. I mentioned that nothing happened to us during our overnight visit or during our tour, but we did have one weird thing happen. We were leaving the on-site restaurant and the guest in front of us couldn’t get the door to exit to open so my adult son (who really wanted to be on the Louisiana trip with me, but wasn’t so sure about the Myrtles portion of the trip) tried opening the door and it wouldn’t budge. However, after he took his hand off the door knob and started to turn to give me a “what the heck” look, the door gently swung open. Now, I’m not saying it’s anything paranormal, I’m just putting the story out there for you all to decide. 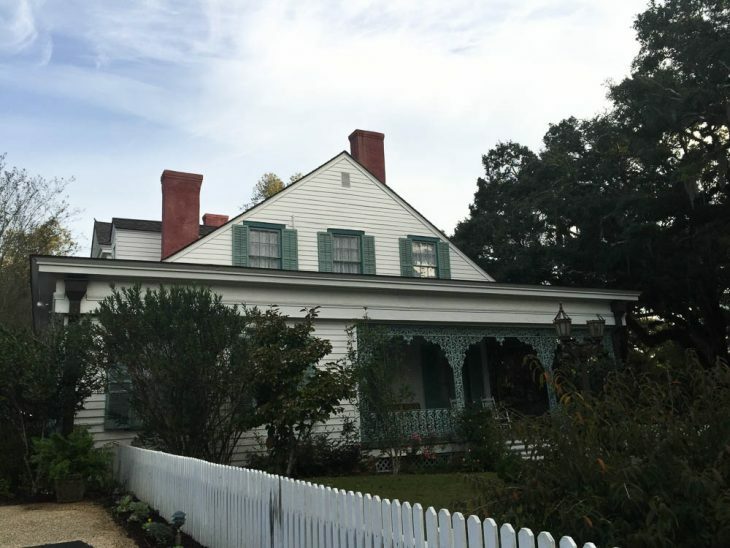 Regardless, if you believe in ghost stories or not a stay at the Myrtles Plantation is an opportunity to experience a night in an authentic historic plantation home. Be sure to chat with the other guests, especially the morning after their stay. If nothing else, you’ll be able to say you survived a night at the Myrtles Plantation, Louisiana’s most haunted plantation. 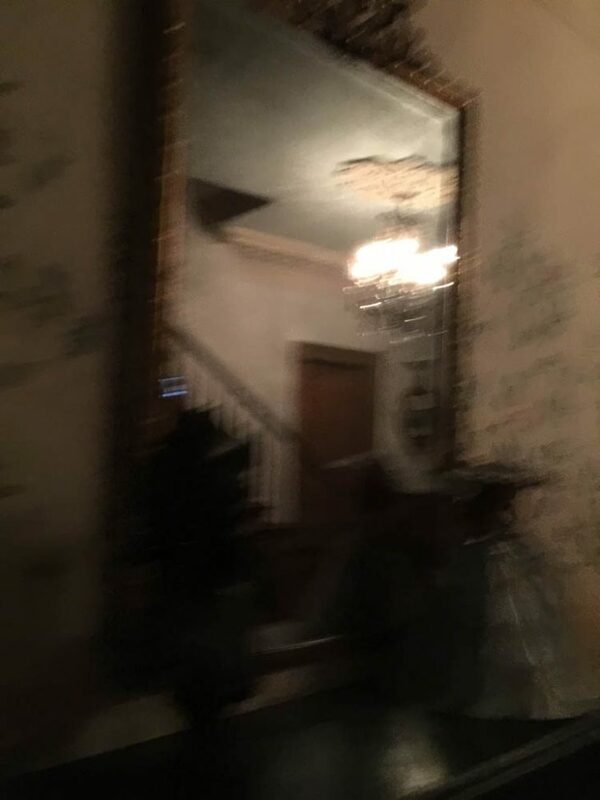 I’ll leave you with this blurry, kinda creepy image of the haunted mirror in the Myrtles foyer. Learn more about the Myrtles Plantation at the following links. If you visit the Myrtles please let me know. I’d love to hear about your experience! disclaimer: I want to thank the Myrtles Plantation for hosting us for a night stay and Visit Baton Rouge for providing dinner and mystery tour of the home. All thoughts and opinions shared above are an honest account of my experience at the Myrtles. Oh man, that is right up my alley! I love all things haunted! What a bummer but overall a pretty place! Glad you had a great time! I would love to hang out at this house and check it out. I love the history that goes with homes like this. Even if they’re history is creepy! Oh how fun! I love anything that has to do with the paranormal. I will have to check it out if I’m ever down that way! This looks like a cool place to visit. I love to go on ghost tours when I travel. I am so envious you’re got to stay at the Myrtles Plantation. .i have always wanted to stay there. I’m not afraid of ghosts. That sounds like an incredible place to visit. I’ve always been fascinated with haunted places. What a great place for a mystery tour and an amazing bed and breakfast. 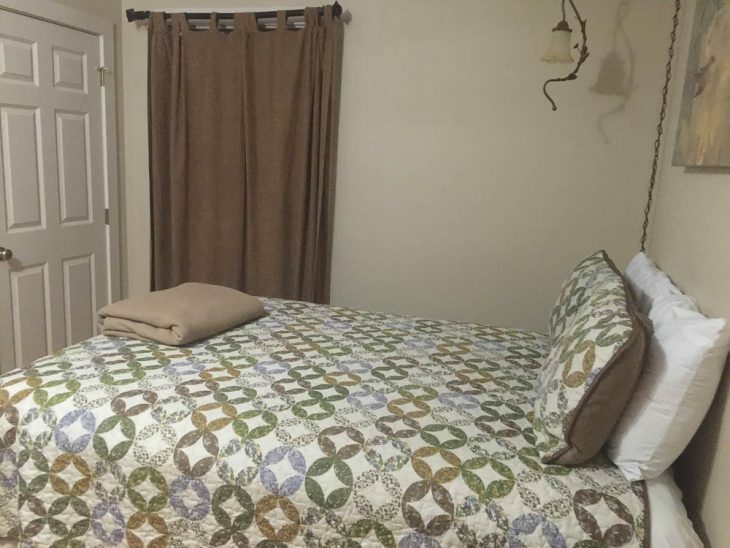 We love to stay at local B & B’s when we travel, much more relaxing than a hotel. I love staying at haunted places like this! 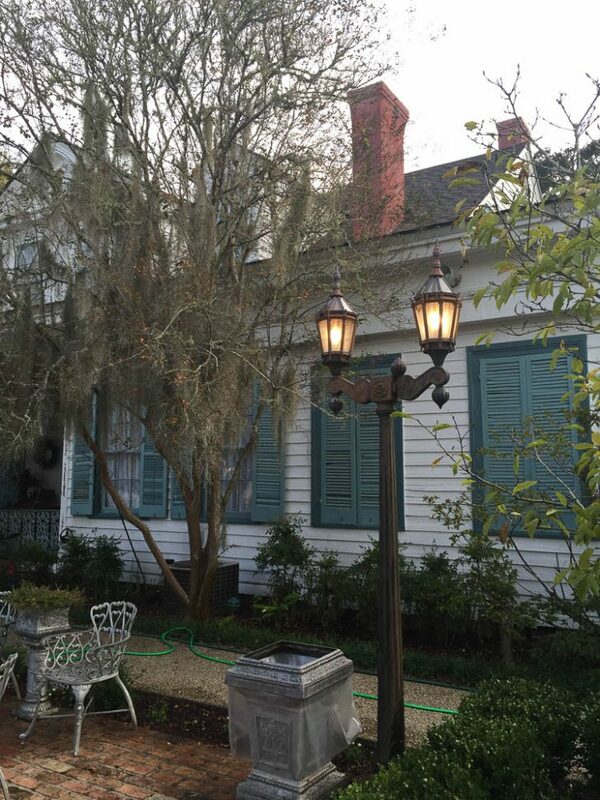 Myrtles Plantation sounds like a neat place to visit and stay. What a fantastic history of the Myrtles Plantation. I’m glad you enjoyed the stay and could get all these great pictures. Those kinds of stories and places creep me out. But it looks beautiful and I’m glad you had a great time. I’m not into the haunted houses. I do like the design of the houses though. What a cool place! I, too, am intrigued by the paranormal. I haven’t experienced any paranormal activity to speak of—only the scent of perfume on one tour and the feeling that someone gently shook me awake when I stayed at a historic inn. I’m not sure how I’d react if I actually saw or heard a ghost. if nothing else, the stories are always fascinating, both from the paranormal aspect, as well as the historical side. It would be amazing to spend a weekend at Myrtles Plantation. It would be fun to go ghost hunting. Myrtles Plantation Bed and Breakfast looks like a great place to go for a weekend. I would love to hear the history of the place and look for ghosts. cool! I can’t believe you stayed there over Halloween! And, I agree creepy dolls are the worst. I think they are more freaky than clowns. Wow, I’ve never heard of this but it sounds pretty fabulous. I am not sure I’d be able to stay there, but it would be neat to visit. It’s a beautiful location, but I could see how it would be really creepy in the dark! I don’t know if I’m brave enough to stay all night. I’m due for a vacay. Not sure I wouldn’t be chicken on a ghost hunt. 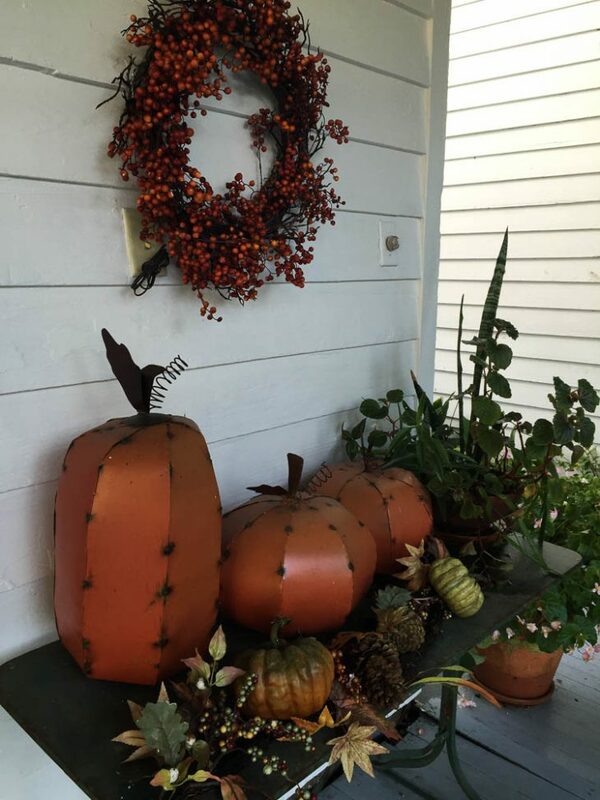 😉 I love those metal pumpkins. Looks beautiful! I’m not sure I could stay there! I am too much of a chicken but it sounds fun! Um…. Next time take me? I love the haunted stuff!